On Friday I headed over to Monticello, just like I said I would. So glad I did as I found a big mess there. That usually means that stuff sold which is always a good thing. In fact, several things were gone including stuff that had been there quite awhile so I was doing a little happy dance right there in my booth. I did bring a few new (old) things to restock my booth. Here's just some of the stuff I brought in. 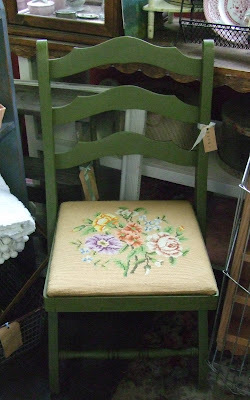 Vintage folding cottage style chair with needlepoint seat. Didn't do a lot on Sat/Sun. Some laundry, read another book, etc. Today (Monday) was the kids first day back to school, so I thought I would celebrate by going to a few nearby thrift stores. Here's what I found. 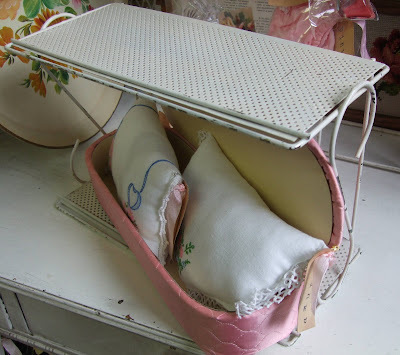 Cute vintage solid wood bed side table, adorable pink vintage baby book, old letter organizer, green tackle box, lamp shade and the most adorable ladies shoes bookends. Here's a close up. They are a little dirty and at first I passed them up, but went back and got them. They are so sweet and I've never seen anything like them. Three pieces of art made with vintage ephemera, a piece of vintage lace, a cast iron key, little kitty, silver card case and fuzzy chenille bees. 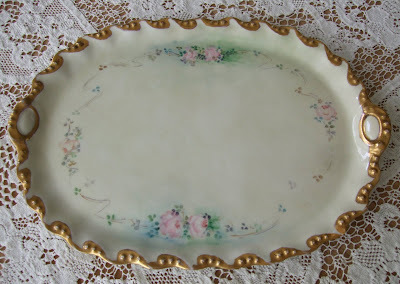 But, my favorite find has to be this lovely hand painted tray. That's it for me for now. I have projects galore swimming around in my head and I really need to get focused and get something done. I did make a trip to Home Depot to buy sand paper, paint and some rollers. Now all I need are a few days of nice spring weather and I can get busy. Happy Monday y'all! Yay, I'm so glad you restocked your booth. 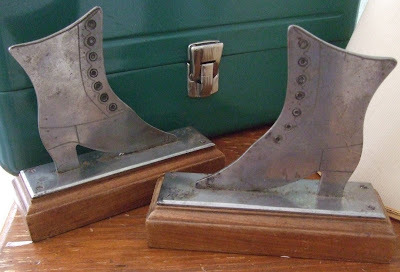 We're heading down to Portland next weekend for the swap meet, and I'm going to visit Monticello's again. I can't wait to go through your button packs!! PS I'm having a giveaway that ends tomorrow, stop by and check it out. I love all of the wonderful finds. Have a great week. Good job! 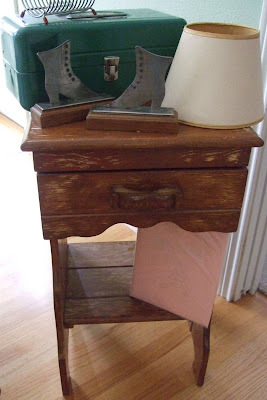 Great stuff (I heart the pink and gray vintage wallpaper)! Your space looks great and I'm glad you found it messy!! 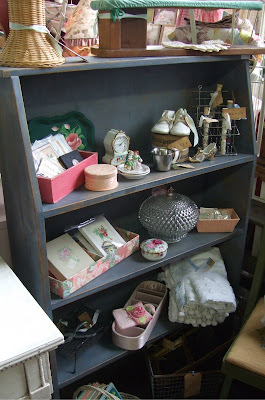 I just stumbled on your blog and had so much fun looking at your wonderful finds! I just LOVE your booth. I saw so many things in your pictures that I would love to buy. You really have so many beautiful things..I just love that wallpaper it's BEAUTIFUL!!!!! 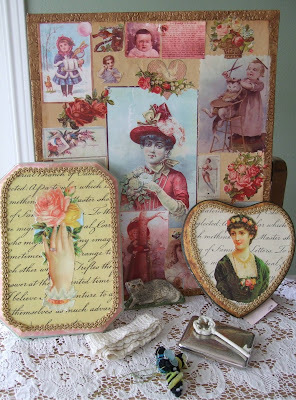 You got some amazing things at the private sell...JUST LOOOOVVVEEEE the vintage ephemera.....That hand painted tray is gorgeous!!!!!! 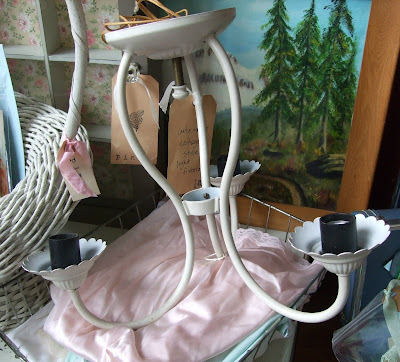 I visited your blog today, & had such fun looking at all of your 'finds'! 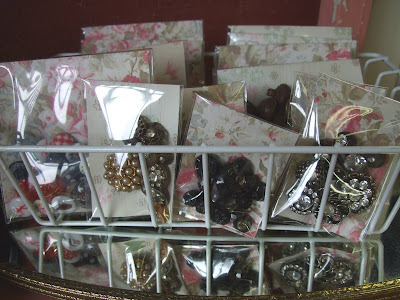 Wish I lived nearby, because I could go wild going through the sparkly jewelry & buckles! Love that chair! So sweet! the hand painted tray is really gorgeous! You have really lovely pieces in your space! Pop on over for my 100th post give-away!